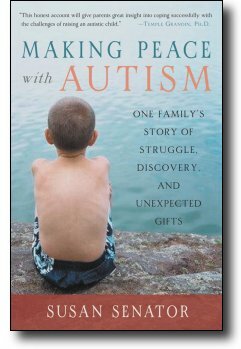 My wife Susan’s book is now out in paperback: Making Peace with Autism. It can be difficult to get information from a publisher about how a book is doing, but their decision to put out a paperback is a very good sign indeed. Susan worked hard writing and publishing the book, and has worked hard over the last year or so publicizing the hardcover, so I’m very proud of her accomplishment getting to a paperback. Couldn't you just figure out how well it was doing from the royalty cheques? I mean, you know what percent of the sales she gets, how much she's received so far, and what the advance (if any) was. So, I'd think it'd just be a matter of math to see how well it's doing. This is assuming of course they cut her a cheque at least once a quarter. Regardless of how it's doing in the market, Making Peace is something your whole family should be proud of. Congratulations on the paperback!